One vital aspect of being organized as a thinker and knowledge-worker is to make sure you have what you need with you at the moment you need it. That means you have to be prepared to carry stuff. This is not always easy to do, especially if you live a varied life in which you fulfill multiple roles — for example, parent, worker, student, teacher, exerciser (as in going out for a run or walk or to the gym), shopper, errand-runner, and so on. So it is vital to think out ahead of time which things you need to carry for each role or task and be prepared to take those things with you when the time comes. For me, where to start on this topic is a toss-up: pockets versus wallet/purse. These two topics really go together, but I will start with wallet/purse. Part of me wants to say that it’s a tragedy to have to mention purses here. I think it is crazy that so many women’s clothes don’t include pockets, forcing women to occupy a whole hand or shoulder to carry a purse. This hampers mobility and makes the user more vulnerable to theft. However, I also recognize that not being burdened with pockets and the stuff that goes into them is a style issue for many women, so I hate to be too critical. Here is a picture of my wallet. This wallet is an Eagle Creek travel-style wallet. It is made from synthetic materials and has a velcro close. It is very large, which I like — it can carry everything I need — credit and debit cards, IDs and membership cards, retail loyalty cards, money, checks to deposit, store coupons, and extra house and car keys in case I lose my regular set or get locked out of the car. Unfortunately, I am not able to find this wallet online to link to — perhaps Eagle Creek no longer makes it. It is a very durable wallet — I’ve had mine for about five years now. A wallet is a very personal thing, so it’s hard to recommend purchasing one online. Better to be able to hold it in your hand and root through it, making sure it has the compartments and other features you need. When it comes to purses, it’s hard for a guy to know what to recommend. However, this organizer from Buxton shown here looks great and seems really useful. 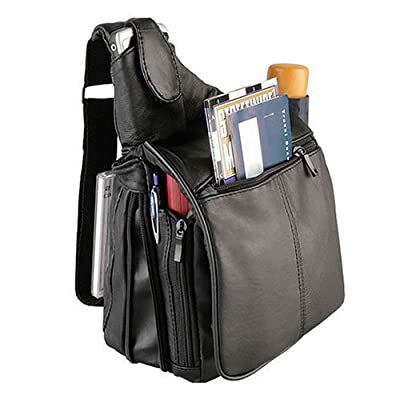 The attraction of the AmeriBag and the Buxton organizer is that they provide numerous compartments and features that allow the user to organize her materials, rather than just throwing them all into an open bag. Now to pockets. To me, clothes without pockets are almost criminal. I no longer buy shirts without pockets, as I need a shirt pocket to carry my writing tools without damaging them. Many years ago, I tried carrying pens in my pants pockets, but found that they would get broken when I sat down. Cargo pants are one of the greatest inventions for thinkers who also care about being comfortable. In the leg pockets of my cargo pants, I can carry my smart phone on one side and my bulky wallet on the other. Unfortunately, leg pockets have not yet appeared on dress slacks or men’s suits, so when I need to look professional, I have to just bite the bullet and put my wallet in my back pocket. Stuff that can’t be carried on your person has to be carried in some kind of external bag. The two obvious choices are rucksacks (backpacks) and briefbags (briefcases). 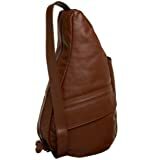 I use a rucksack when I go out for a task that will require extended walking — if the setting of the meeting permits the informality of a rucksack. Both the rucksack and the briefbag have laptop compartments, and important feature to me, as I usually bring a computer when I travel out of town. For crucial activities with specific equipment requirements — certain books, notebooks, papers, files, etc. — I set aside a briefcase or bag specifically equipped for that purpose. For the most part, the briefcase is the permanent repository for the required items. That way, I don’t have to worry about loading up the briefcase every week before I head out to that meeting — and there’s less risk of forgetting something. For example, as a voluntary religious teacher, I attend meetings for worship twice a week, at which I have extensive teaching and pastoral responsibilities. The meeting case show here is the one I use for those meetings. This is a Goodhope Computer Catalogue Case. It looks great and is very rugged and well-made. My main complaint is that the middle section is somewhat hard to get your hand into to retrieve a book. To be fair to the makers, though, that middle compartment was originally meant to hold a laptop rather than books. Below is a photo of the case when it is closed. In the past, I have used a meeting case that was completely open at the top. I think that was a better design, as it allows the user to reach in quickly to grab a book or other item. With the Goodhope case, I often find myself groping for an item placed in that middle compartment. So I think next time I have to buy a meeting case, I will go back to the open design. Most knowledge-workers these days have to be mobile at times. Give advance thought to the equipment you will need for the various situations you confront — and how you’re going to carry the stuff you need.